Departure from Kochi at 9 a.m. Morning proceed to visit Jewish Synagogue- Mattamchery (open 10 am to 12 noon and 3pm to 5 pm closed on Friday, Saturday and Jewish Holidays). Built in 1568, the oldest Synagogue in the British Commonwealth. Dutch Palace – Mattanchery (open 10 am to 5 pm closed on Fridays). Built by the Portuguese and presented to the Raja of cochin in A.D.1555. The glory of the palace, lies in the murals which are in the best traditions of the Hindu Temple art, religious, decorative and stylish. Other exhibits like portraits of the Rajas of cochin, Arms, Umbrellas,Palanquins,the ceremonial Royal Dress,Cloth Canopy, Stamps,coins etc… St.Francis Church Fort Kochi –(closed on Sundays). The protestant church was built by the Portuguese in 1503 and is believed to be the first church built by the Europeans in India. Vasco-da-Gama’s body was buried here. Willingdon Island – A man-made Island Created with the material dredged, while deepening cochin port. 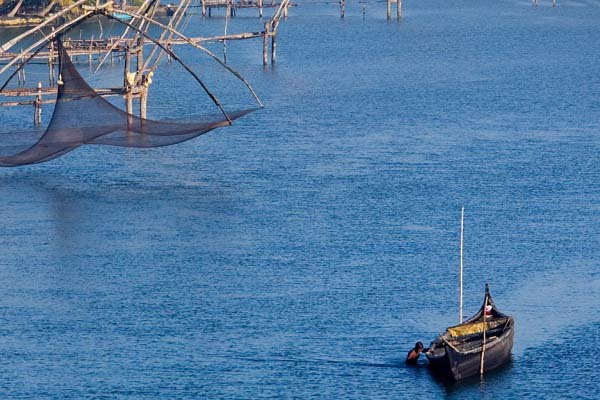 Chinese Fishing nets, Afternoon Backwater Canal Tour(Experience the beauty of Kerala Backwater and Village life) after visit Cheenavala Palam and Royal Walkway.